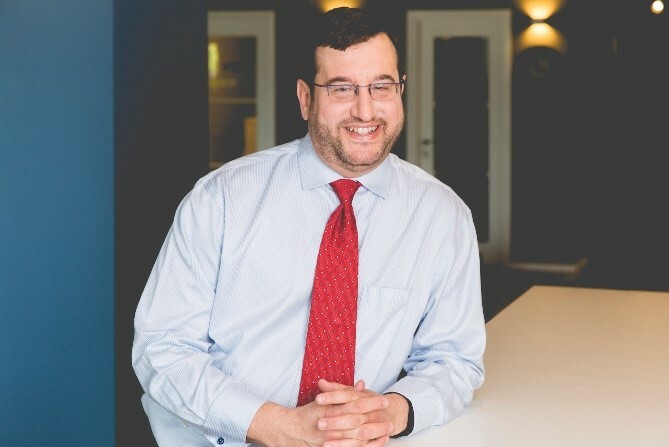 Executive Director of A Leg To Stand On (ALTSO). Family Office Insights sits down with Gabriella Mueller, Executive Director of A Leg To Stand On (ALTSO), to discuss the New York based 501c3 non-profit organization committed to providing free orthopedic care—including prosthetic limbs, mobility aids and corrective surgery—to children with untreated limb disabilities in the developing world. Tell us about your background and your nonprofit organization, A Leg To Stand On (ALTSO). I volunteered with A Leg To Stand On (ALTSO) in 2006, and quickly became enamored with the work they were doing, perfectly aligning with my interests in civil rights and helping the underprivileged have a leveled playing field in life. Today I am the Executive Director at ALTSO, proudly overseeing our organization’s growth from three programs to over 10 programs, and from ~100 children treated per year to over 1,000, in just a few years. After seeing firsthand what ALTSO provides in patient care and prosthetics to children with disabilities in developing nations I learned so much about the importance mobility has on a patient’s a ability to gain self-esteem and access opportunities through education, work and self-sufficiency. ALTSO is a New York based 501c3 non-profit organization that provides free orthopedic care—including prosthetic limbs, mobility aids and corrective surgery—to children with untreated limb disabilities in the developing world. In doing so, ALTSO is able to offer children who have lost their limbs in traumatic accidents or suffer from congenital limb disabilities the physical capabilities necessary to access education, work and daily mobility. Our first clinic opened in 2003 in Ahmedabad, India, and to date, we have treated more than 16,000 patients worldwide. This year, ALTSO is operating 10 programs in 9 developing countries across Asia, Africa and Latin America. On September 28th, 2017, ACG New York, Tricap Partners & Co., Eaton Partners, and Reed Smith LLP are hosting the inaugural NYC Finance Luncheon at Zuma from 12pm to 2pm to support ALTSO and welcome like-minded leaders from the finance community. A special menu has been prepared by Zuma Executive Chef, Oliver “Ollysan” Lange. Chef Ollysan’s food is influenced by his time in Japan, where he trained with sushi masters and earned his nickname. Each guest will also receive two complimentary tickets to ALTSO’s Hedge Fund Rocktoberfest event on October 26th, 2017. Our 14th Annual Hedge Fund Rocktoberfest will be held at the Hard Rock Café in Times Square. This event unites over 1,400 leaders from the alternative investments and finance industry for a night of rock & roll and acoustic music, featuring more than a dozen bands whose talented performers are industry leaders. For more than a decade, Hedge Fund Rocktoberfest has gathered colleagues, friends, current and prospective clients for what has been recognized as one of the most unique, highly anticipated and effective events in the charitable and finance sectors. With the generosity and dedication of our sponsors including PAAMCO, Goldman Sachs, BNP Paribas, MKP Capital, Societe Generale, Lyxor Asset Management, and more, ALTSO has been able to provide life-changing treatments to children around the world. Who are the primary guests at these events? Our attendees for the NYC Finance Luncheon and the Hedge Fund Roctoberfest include: high net worth individuals; investment bankers and advisors; fund of funds; foundations; prime brokers and service providers; hedge fund managers, traders and analysts; the FinTech community; multi and single family offices; private equity firms; institutional investors; proprietary trading firms; venture capital firms; and pensions and endowments. The primary challenge is communicating how relevant our mission is. There are so many corporate foundations that primarily focus on giving money to those directly impacted around them, such as New York-based causes rather than global issues in the developing world. Once we are over that barrier, we come across the hundreds of charities in New York City looking for the same advocacy and support. Fortunately, the support we’ve received continues to increase, so much that it allows us to offer the most cost efficient care for thousands of children. A standard prosthetic in the US can cost at the minimum around $10K, but we are able to offer our patients and their families our prosthetic devices at a cost of $250, which we provided 100% free of charge. How are you different from other non-profit organizations? Our mission differentiates us. We don’t know of any other organization in the US that exclusively provides free orthopedic care to children in developing nations for families living on an average income of $2.50-$10 a day. When a child comes in at age 3 as an amputee, we are committed to continuing to provide the adjustments they’ll need to their devices all the way through the age of 18. On average, they will need to be refitted and resized every 6 months, which we fully provide and cover. We also have the ability to track our impact on a very comprehensive level. Aside from focusing on the number of patients we provide care for, we are also able to track if the patient was able to attend school because of his/her new orthopedics, and if he/she is able to walk independently. I’m very happy with the way we have been able to improve impact measurements by asking the right questions to gathering the right data from our partners and patients. Our patient demographic are most often overlooked or forgotten by other humanitarian aid organizations. Lack of mobility is not typically considered life threatening – but for ALTSO’s patients living in the developing world in the most modest of conditions, lack of mobility is absolutely a threat to their lives. A majority of ALTSO’s patients live in impoverished areas with no accessible transportation to school, which is on average a 3 mile walk each way. Without the correct orthopedic care, they are unable to walk or bike to school, which makes future employment, providing for family, and reciprocating to community impossible. Not only have we been tackling this problem since our inaugural program in 2003, but this year we are rolling out a new prosthetic device that brings a higher level of quality at a lower price point. This new steel and aluminum device is innovative, cost effective, lightweight, and durable - not to mention they also look cool. For a child already suffering from a limb disability physically, we know that emotionally they can suffer as well. By not only providing a high quality device, but also a sleek and clean design, ALTSO patients can be as proud to rock their new limbs as we are to provide them. We believe strongly in offering a caliber of devices that meets as many needs as possible for our kids - all the way from toddler to teen. By considering every angle of a patient's’ needs, ALTSO is changing the way nonprofits look at providing care in the developing world. We not only focus on provision and cost but also quality, durability, adaptability and looks - because we know that movement is so much more than just mobility. Who is the ideal guest at ALTSO’s events? Any C-level executive or senior decision maker from a hedge fund or a service provider will find our events to be informative, inspiring, and a great networking event unlike any other. Our donor demographic really enjoys our events every year, and is constantly spreading the word for us out of the love of our mission. It’s a more organic networking event focused on a greater cause, which they feel compelled to support by their own volition. What’s A Leg To Stand On’s mission? We want to provide children with limb disabilities living in the developing world with physical opportunities that mobility offers such as, education, employment, and self-sufficiency. What’s next for A Leg To Stand On? 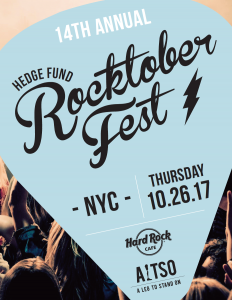 ALTSO’s signature event, Hedge Fund Rocktoberfest unites more than 1,400 guests from the alternative investments and finance industry for a night of rock & roll and acoustic music, featuring over a dozen bands whose talented performers are industry leaders. For more than a decade, Rocktoberfest has gathered colleagues, friends, current and prospective clients for what has been recognized as one of the most unique, highly anticipated and effective events in the charitable and finance sectors. This year's 14th anniversary will celebrate the more than 16,000 children treated to ALTSO to-date, thanks in large part to the success of Rocktoberfest. After traveling extensively throughout developing countries in Latin America, Gabriella decided she wanted to do something to help the many children she saw begging for money or food. In 2006, she signed up to volunteer at A Leg To Stand On. Now the Executive Director, Gabriella is humbled to have overseen the organization’s growth from three programs to over 10 programs in six years, and to continue cultivating relationships with supporters as passionate about A Leg To Stand On’s mission as she is. For more information, please reach out to Gabriella at gmueller@altso.org.